Odin is the name of the project and software that allows users to run Win32 applications in eComStation (OS/2) operating system natively, almost as if they were intended to be OS/2 applications in the first place. It also makes porting from Win32 to OS/2 easier by providing a Win32 API implementation in OS/2: the Odin32 API. Converting PE (Portable Executable - Win32 binaries) objects in OS/2's LX (Linear eXecutable) format. Reassembling them in memory in the way OS/2 applications are supposed to be assembled. Converted/loaded program will look and behave as any other eCS (OS/2) application. There is no emulation layer, no Windows "sessions" or virtual machines like it was the case with Win-OS/2 that IBM has provided for running Windows 3.1 applications: the code is executed directly by CPU with all rights, privileges and limitations of normal 32-bit eCS (OS/2) programs. In order for program to operate, it must have access to the same API functions as in Windows operating system(s). Those functions are called Win32 API (Application Programming Interface) and Odin provides them, as well. It's the second part of the project which aims at: Providing runtime libraries that replicate Win32 API functions and that are used by loaded and running programs. Runtime libraries are supplied as a number of DLL files with the same names as the ones what are supplied with Windows because Win32 applications expect to find them under those names. Any name conflicts (DLLs with same names shipped with eCS (OS/2)) are resolved during the conversion/loading process. Odin32 DLLs are pure native eCS (OS/2) binaries which operate in the same way as their Windows counterparts. The set of API functions that are implemented for Project Odin is called Odin32. The Odin32 API can also be used (and is used) for native eCS (OS/2) development, as for porting software from Windows. Since it replicates the functionality of the Win32 API closely, a porter can much easier match the basic functionality and then add eCS (OS/2) specific improvements. A very good example of an application which is using this technology is OpenJDK6 for OS/2. It is compiled using Odin32 API and eCS (OS/2) specific behavior was added as well. The final goal of the first part of the project is to make every Windows program load and operate properly, and the goal of the second part of the project is to create complete eCS (OS/2) implementation of Win32 API, which means that every single API function should be implemented or mapped to equivalent eCS (OS/2) API function via Odin32. Whether those goals will be ever achieved remains to be seen, but this project gives good results even now, since no Windows program uses all API functions and very few use even majority of them. The latest version is 0.8.9 released on 17.02.2013. The list of changes can be found in the ​ChangeLog file. We also provide a Zip package of Odin (see below) for your convenience, if you cannot use RPM for some reason. Older ZIP and WPI packages are available ​here and ​here. 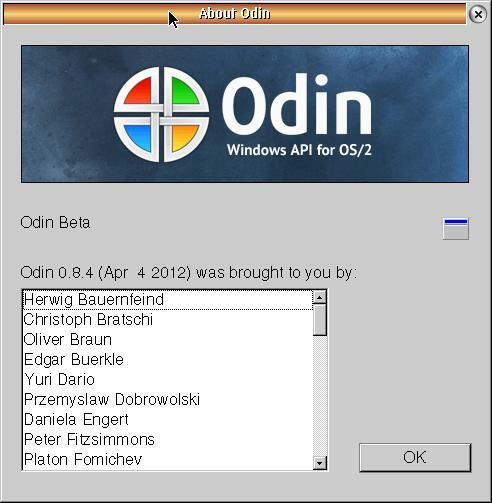 A small note on the OdinApp Package: This package is only needed for Win32 apps not built with the Odin SDK. We provide a Zip package of it (see below) for your convenience. This is a list of prerequisites for the Odin ZIP packages. Note that if you use the RPM packages, these prerequisites, except xsystray, will be installed automatically. Xsystray are not in RPM repositories yet so you will need to install them from WPI in either case. GCC 4 Runtime Libraries ​WPI GCC 4 runtime libraries needed for all Odin installations (required). xsystray widget ​WPI Extended system tray widget for xCenter/eCenter for system tray support In Odin (optional). Odin Runtime Libraries ​ZIP Odin runtime necessary to run Win32 based applications. OdinApp Package ​ZIP The OdinApp package is only needed for Win32 apps not built with the Odin SDK. That project is *not* a fork of the original Netlabs project. Odin with functionality to enable porting of SWT to OS/2. There is a (rather outdated) page in the ​netlabs.org Wiki about Odin, feel free to contribute to it! Also we have a ​mailing list at netlabs.org, you can read it at ​gmane.org, or you can subscribe by mail. The name of the list is odin-user@…. To allow proper coding and usage of Trac&Subversion features, it is suggested to follow some guidelines. First, all commits must belong to a ticket; tickets can be created by project manager or by developers for defect fixing, code enhancements or other tasks. Trac timeline will automagically convert 'ticket:1' into the URL of the ticket. (changeset:145) Here are my changes. This allows following ticket life without looking at timeline changes every time. While the commit message is usually short, developers can add more detailed informations in ticket record. Remember, other developers could not know what you are doing, or understand what has been changed simply looking at code. Also we need to track changes to avoid regressions as much as possible: exhaustive descriptions makes life much easier when regressions or typos must be fixed. odin.jpg​ (36.9 KB) - added by diver 7 years ago.